Get notified when FC Dallas tickets are available! 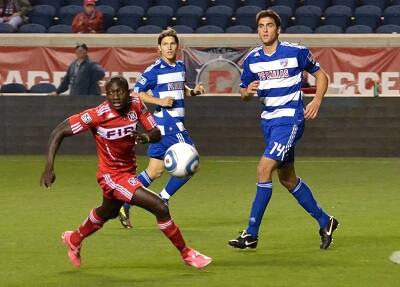 FC Dallas is a professional American soccer team from Frisco, Texas. They play as a member of Major League Soccer, beginning as the Dallas Burn in 1996 until they changed their name in 2005. They were the champions of the U.S. Open cup twice and placed in the finals twice as well and have won three other cups as well. FC Dallas’ home games take place at the soccer-specific Toyota Stadium in Dallas which can accommodate 20,295 guests, and you can be one of them or see them play at another location by purchasing FC Dallas tickets using the links above.